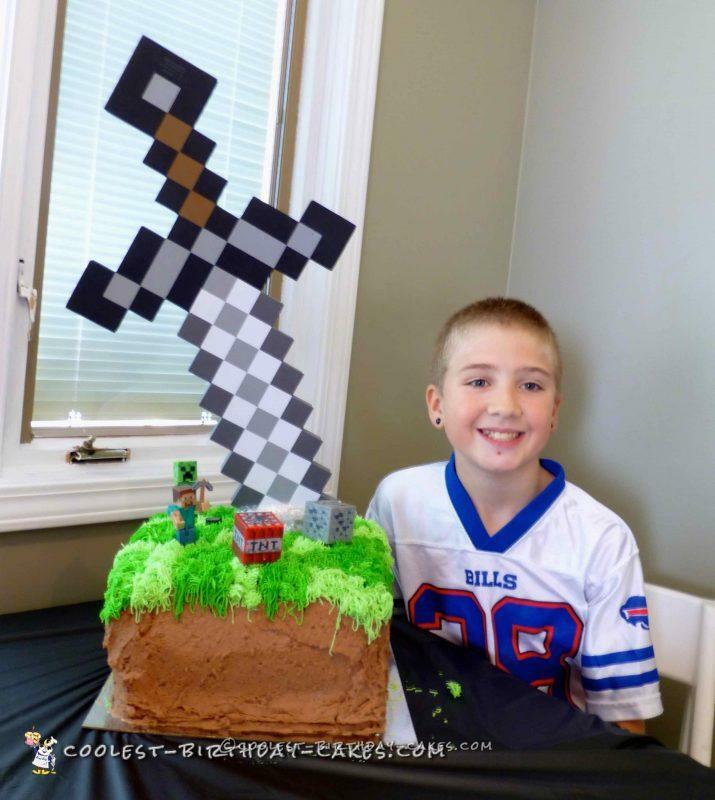 My grandson was turning 11 and as most 11 year olds, he’s so into Minecraft! I had made his sister Elsa and Anna cakes a couple months ago, and now he wanted a Minecraft cake. This should be much easier, or so I thought! I bought a 10″ Wilton square pan. I wanted it to be a little bigger than the 8″ square browning pan I have on hand. I baked 4 cakes, one at a time, 2 chocolate and 2 vanilla. In hindsight 3 would have been plenty, but it was my first time. I used the same recipes for the cake that I used for my granddaughter’s Elsa and Anna cakes. It’s a nice firm cake, and won’t “squish” when you stack them. I used chocolate cake mix and added 4 eggs, 1 cup of sour cream, 1/2 cup of water and 1/2 cup of oil. Each 10″ square cake pan held this whole batch. I made 4 cakes, one at a time. As each cake came out of the oven I set the pan on a wire rack for 10 minutes and then inverted it onto either wax paper or parchment paper, so it would not stick to the wire rack. I let this cool completely. A word about the cake pan. I used Pam with flour and the cakes came right out! Just make sure to spread the Pam all around the whole pan, and get those corners! Next, I made a batch of buttercream frosting. I had bought a 12″ cake board so I put a dab of frosting down on the board then the first layer of cake. I layered the cakes chocolate, vanilla, chocolate, vanilla with buttercream between each layer. This used up that batch of frosting. I made another batch and just added 1/2 cup of cocoa to make a chocolate frosting. I also added the 100 calorie Oreos ground up in my food processor. I spread this all around the sides of the cake, so that it looks like dirt. Next. I made another batch of buttercream and I separated this into 3 different bowls. I tinted them 3 different shades of green. Only two didn’t really turn out different. I then took a ruler and lightly scored lines on the top cake to make small squares. I took my grass decorator tip and on random squares made frosting grass. I did this all over the cake and tried to have the grass come down the sides. I found that I had not put enough milk in my frosting as it was not sticking well to the cake (the grass frosting). My grandson wanted either the Minecraft sword or axe sticking out of the top. I was looking for the foam ones so it would not be too heavy, but I could not find them at any stores and there was no time to order online either. Then it came to me. It was close to Halloween! The Party Store! Sure enough, they had them and I had a 50% off coupon. I chose the sword. 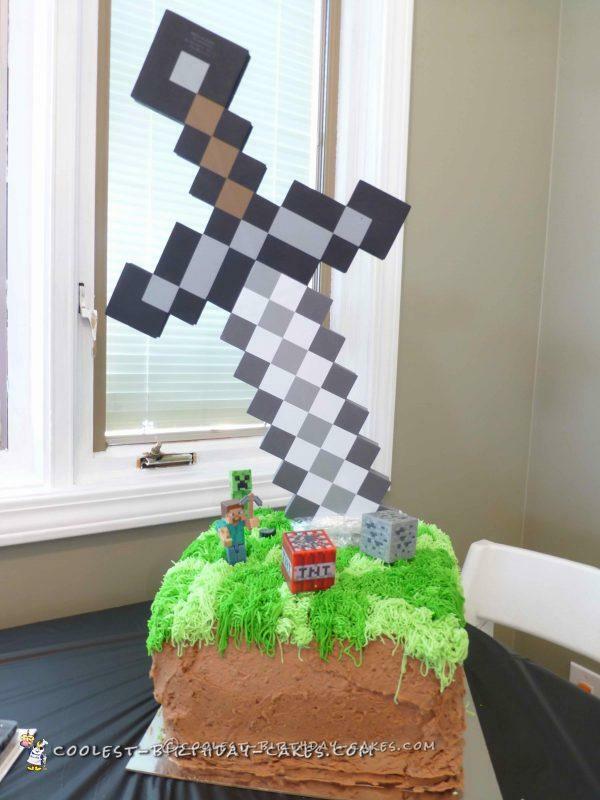 While at one of the other stores I purchased a “Steve” and “Creeper” to also put on top of the cake. All in all, it turned out well and he was happy, which is all that counts, but there was way too much cake! Next time I would only do a 3 tier cake. I also might make a smaller sword. The one I purchased seemed huge in the cake. Like I said, though, he was happy!